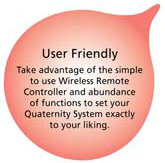 Quaternity incorporates extensive technological innovations giving features and benefits that deliver a solution significantly superior to a traditional “mini split” system. The system delivers one of the highest efficiencies on the market, with added features such as being able to set and monitor relative humidity, an integrated air cleaner module, and an excellent range of cooling and heating capacities. Quaternity represents a solution offering complete peace of mind. 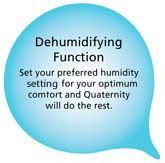 One of the first heat pumps capable of controlling humidity levels to a relative humidity setting. Click here for more information. 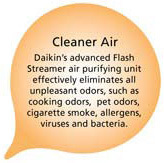 Purifies and removes allergens from the air. Daikin’s Flash Streamer technology is proven to deliver over 1,000 times faster purification versus normal “plasma” type systems. Click here for more information. Up to SEER 26.1 and EER 15.8, one of the highest energy efficiencies in the market. Click here for more information. Delivers incredible heating capacity at lower ambient temperature (down to -4ºF). Click here for more information. 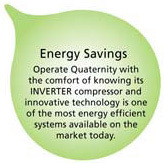 Comfort The inverter repays its investment many times over by improving comfort. An air conditioning system with an inverter continuously adjusts its cooling and heating output to suit the temperature in the room. The inverter shortens system start-up time enabling the required room temperature to be reached more quickly. As soon as that temperature is reached, the inverter ensures that it is constantly maintained. Energy efficient Because an inverter monitors and adjusts ambient temperature whenever needed, energy consumption drops by 30% compared to a traditional on / off system.